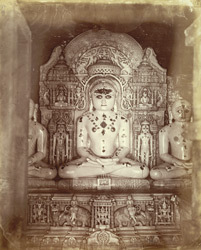 Photograph of the marble image of Rishabhadev (or Adinath), the first Jain Tirthankara, in the Ramaji Gandharia Temple, Satrunjaya. Lyon wrote: "This figure is in the temple of Ranigi Gandharia, it is the image of Rishabhadev the first Tirthankar. There are two others, one on each side, but owing to the want of space cannot be fully shown in the Photograph. The idol itself is of alabaster, quite plain with rubies and a few other precious stones in the breasts, eyes, &c. The position is curious but is that in which all the Tirthankars are invariably represented. The screen round the principal figure is of pure white marble carved in a manner which though grotesque cannot fail to excite our warmest admiration."